We are a Hog Roasts Leeds catering company who don’t just serve the Leeds area but also the rest of Yorkshire. With major roads nearby we travel frequently up and down them providing Pig Roasts and Hog Roasts in Leeds or barbecue in Sheffield or spit roasts in Hull in fact we travel as far north as Darlington and as far south as Chesterfield and cover all the bits in-between. Flavoursome Hog Roasts are our passion! Established back in 2006 we rapidly became one of Yorkshire’s favourite outside caterers specialising in carrying out large professional Barbecue and Hog Roast catering to consistently high standards using only the finest free range and locally sourced ingredients for all our menus. Our real claim to our fame comes from our amazing hog supplier and her stunning free range hog roasts which are a special cross breed and is thought to be in the top 1 to 2% of high quality elite free range pork in the country, having won the prestigious Good Pig Award in 2012 and attained the Supreme Champion Award from Deliciously Yorkshire there is no doubt that these are indeed very high quality hog roasts and Pig Roasts that once tasted speak for themselves. However we constantly strive to develop new and exciting menus that will continue to push us further and further like our magnificent range of authentic Spanish and traditional Gastro fayre big pan menus a really new and innovative way of both feeding and exciting your guests as they get to see everything being prepared before being served straight from the big pan itself to their plate, wonderful and amazing are two of the words we are often told that this experience is. But having said all this you can pull apart our menus and mix them up taking elements in and out to suit your budget, suit your taste and to suit your specific requirements. Feel free to email us or call us to chat about Hog Roasts Leeds catering or any ideas you have for doing this we will be happy to hear from you. 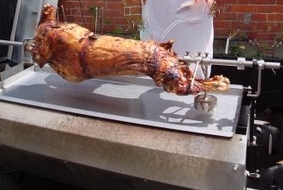 Leeds Hog Roast Event Catering can cover all manner of parties, gatherings and special occasions. Suitable for small or large events, we’ll make sure your Wedding Buffet catering, business catering or personal catering service runs smoothly and provides some of the best food in Yorkshire for your special event. We can serve hog roasts Leeds catering, Leeds Pig Roasts, Barbecue food, Big Pan catering or wedding food. Our Street Food menus have also become extremely popular and we often setup mobile kitchens for open-air and public events serving hot and delicious free range food. Whether indoors or outdoors, our mobile kitchen can cater to waited tables or provide a hot buffet service.